Hmm… a restaurant called Phnom Penh India. Guess where it is and what sort of cuisine it serves? Anyway, we were quite happy to give our Plan B a go, so we carried on down Sisowath Quay to Phnom Penh India, a smallish restaurant a little way north of the Foreign Correspondents’ Club and not too far from the California 2’s old premises. We ordered a big bottle of Beer Lao between us. Somewhat unusually, the waiter opened the bottle but, rather than pouring it, he balanced the cap on top of the bottle and left us to pour the beer ourselves. Still, the beer and glasses were cold. The menu was pretty extensive, though with a couple of amusing typos. For instance, $600 for a vegetable thali seemed rather steep. They hastily confirmed that it was indeed $6.00. 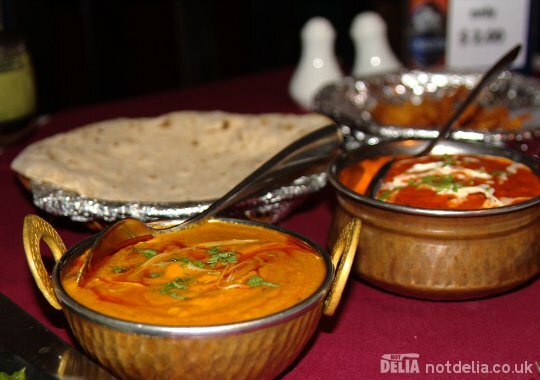 We ordered onion bhajis to start, then a vegetable thali (nice to have a selection of different stuff), butter chicken and a prawn curry (the waiter asked us for our preferred heat; we asked for medium), with two chapatis. We also asked for garlic naan, but were reminded that the vegetable thali included a plain naan. We thought that was pretty good service. 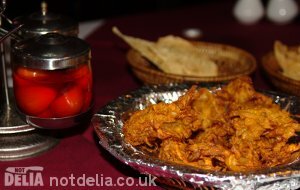 First out came a couple of freebie nibbles – papads and gram flour snacks, with the usual pickle-type accompaniments. The coriander chutney and lime pickle were pretty much as you’d expect. 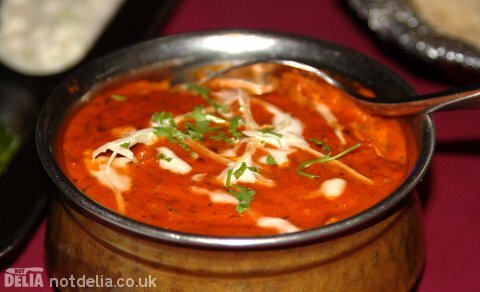 But the pickled onions were massive in comparison to the usual British curry house offerings, and reddish rather than the garish pinky-purple colour you generally get. And instead of the standard mango chutney there was some strange brown stuff which I thought might be tamarind-based. The onion bhajis arrived fairly promptly. The presentation was nothing special – a basket covered with some rather crumpled tin foil – but they were hot, nicely cooked and had good complexity of taste in terms of spiciness, texture and freshness. Who cares about presentation that much? We were feeding our stomachs, not our eyes. 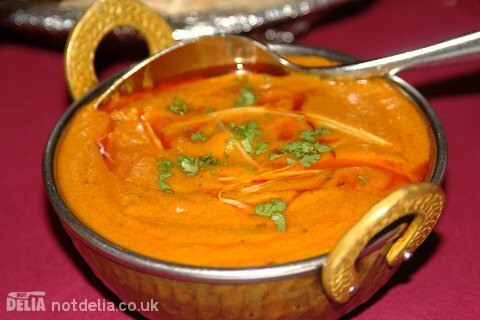 The butter chicken was really rather nice too. Pleasantly spicy without blowing your head off. We’d asked for medium hot, and that was what we got. The prawn curry, likewise, was good. Our only mild criticism was that it was lacking depth of flavour. As you can see, they’ve sprinkled a little freshly chopped coriander on top to finish it – but it really needed rather more than that to give it that extra dimension. But the prawns were cleaned and not overcooked. 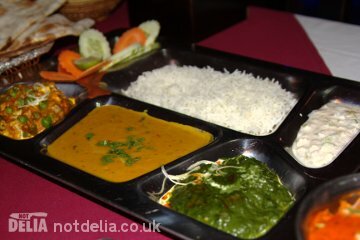 The grains of the rice were separate and cooked perfectly – it was a bit of a shame that we didn’t have room to eat much of it – and the dal went well with it. The raita was much as you’d expect. The only real let-down on the whole tray was the “salad”, which consisted of a few slices of onion, carrot and cucumber with scored edges. A proper kachumber would have been nicer. The staff were attentive. Possibly a little overly so – at one time there were three of them watching us like hawks. But then it was rather quiet in there when we visited. A pretty good place to go if you fancy an Indian while in Phnom Penh. Not the most comfortable of places, but the food is good – sometimes very good.